Following professional Shogi player Rei Kiriyama through the ups and downs of his young career, personal life and internal struggles, March Comes in Like a Lion promises to be a story rich in character development and heart-plucking drama. 17 year old Rei Kiriyama moves out from his foster family and leads the intense life of constant competitions and isolation from all social aspects of life. Trying to keep considerable distance from bonding with anyone, he finds himself being included into the kindhearted Kawamoto residence, which provides a homely connection he lacked from the recently departed foster home. Success comes and goes as it does, and the pro player comes to the crossroads that accompany the trials and tribulations of life. While last week could have easily given enough closure for a finale on its own, it was fascinating that they decided to give a small taste of the upcoming season in Rei’s repeated year of school. Lots of subtle building blocks like his Shogi tournament bracket setting up for a finale with his closest friends and making a Shogi (and science) club will more than likely go a long distance in the grand scheme of things. Undoubtedly, with the timing of the second series being announced, a chapter like this is as perplexing as it is exciting. It would be interesting to see more shows tease what would essentially be a pilot for the second season in the last episode of the previous season like this. The half of the episode titled Fighter (based off of the OP of the first cour) was a satisfying end to the beautiful half year go the series had. A little bit of backstory, character development, and foresight really go a long way here. The growth of Rei’s character is astonishing once you take a step back and think about it all. He was so stoic and taken by the world before, and now he is this survivor who will scratch and claw through hardship in as big of a way as he can muster up. The build to that was slow and methodical, but it was absolutely worth it in reflection. This is the kind of series aspiring artists need to add to their “To Watch” list for sure, and a sure fire recommendation for anyone looking for an accurate depiction of depression and silver linings of the world. In One Line: Rei begins the new school year after being held back for attendance as he reflects on what has gotten him to the point he is at now. The Shimada story comes to a really satisfying end as the local champion reflects on the unconditional support of his hometown people and how their love is his motivation for enduring what he does. I felt like the festival bits were a more lighthearted end to the crushing end of Rei’s mentor. The entire show has taken such a leap from where we started with it- what felt like out of place comedy in pretty serious drama blends well with the rest of the agenda in a very satisfying fashion. For the definition of “lighthearted” though, look no further than the return of the Kawamoto sisters. Headlined by Hinata and Akari test tasting other desserts to spark some inspiration, there really was something simple yet effective with their little adventure. One of the best moments of the series was had in this episode with Hinata thinking about Rei and calling him, only for his cell phone to be going off right outside her door (as seen above). Her asking him to come over for dinner with him there struggling to figure out how to ask to come over was so sweet that it was impossible not to resist. In One Line: The Shogi players host events at a local event as Shimada reflects on his town, the girls experiment with new dessert ideas and Rei finally comes over for dinner after a long journey. One of the more striking analogies created early in this series was how Rei felt he was swimming in stormy waters, struggling to stay afloat. There was a dark green and black aesthetic that chaotically illustrated the depth in a young man’s struggle. Very similarly, a pair of effective shots of Shimada walking in the snow, facing a blizzard and one of him dreaming of a life without the professional competition weighing him down. These are truly unique moments to the struggles of one character personified, rather than Rei. There were bits from other people but it was always spoken in third person, and not from the horse’s mouth. I like how the visual storytelling method is not exclusive to the main character. At the end of the day, I’m going to remember this show for how well it captures the whirlwind of emotion that accompanies taking the path less traveled. The challenges of success and overwhelming will to fight that keeps struggling people from surrendering. It is a beautiful, tortured portrait of the human spirit. In One Line: Shimada’s fight reaches a wall as Rei fights his own expectations of his new mentor. Kai Shimada’s backstory really did well this episode in making him one of the more interesting layers to the story. The worn road of a once cocky kid turned patient fighter bouting stomach pains felt like a genuine character development. For every outrageous support character they sometimes slip by in March, there is a Shimada there to blow you away with depth and passion. The pain and determination he has for the game whilst enduring a massive stomach issue was downright inspiring. The second half was SHAFT destroying everyone with their outstanding background art. It would be faster to name the number of times they didn’t flash a brilliant shot through the classic Japan setting. It isn’t for everybody, but the stretch the series has been going on is essential to anyone appreciative of good background art or how to properly pace a steady story. It has been a long journey, but the artistry is oh so worth it all. In One Line: Rei assists Shimada with health issues as the latter’s backstory is explained. The third round of the tournament has come to an end, and it would really appear that Rei has dedicated to the workshop. Letting himself get destroyed in practice against much better talent than him as a learning experience is a big departure from his old stance of being unable to take one blow before the house of cards fell over. Each hit makes him a little stronger, and with the right support, he has finally learned to cut some slack on himself. Maybe one of the biggest revelations for the girls in close to ten episodes is that Akari finally figured out something wasn’t right with Rei’s prior house life. With the dots connecting, I am really fascinated to see if she confronts Rei about it or if it is one of those things she just keeps in her back pocket (because obviously the other two girls didn’t think twice about it). It would definitely break the mold of the show, so don’t anticipate anything heart plucking from a one on one like that anytime soon. Regardless, it is a development worth noting and worth seeing play out. In One Line: The third round of the tournament ends, Rei gets spring break off, and Akari makes a discovery about her frequent guest’s past. The number of episodes that could be counted that contended for “most beautiful looking thing of the season” easily requires two hands to count by finger, but this week easily shouted into the top three or four with its magnificent shots and solemn use of lighting. Something so basic in a room being lit by a cellphone transformed into a haunting backdrop on a pretty heavy familial issue. With every stagnant encounter between his family, things get further and further away from Shogi for Rei. Maybe an undervalued element in a visually jarring session is just how aware it is made to him by seeing his opposition blossoming whilst regaining his composure. Also, the unexpected crossed paths of the Kawamoto girls and Kyouko led to a relentless assault on Rei that ended in a confusing meltdown by the sister in regards to what the youngest, Momo said to her. If you were to ask ten people what March is, you’d get ten vastly different answers with the sample we have now. As a single product, it is a roller coaster of character development and subtle messages of overcoming life’s hardships. Slice that up into seventeen pieces, and the answer might become an extravagant art project. Surely the adjectives of choice range from “introspective” and “methodical” to “whiny” and “boring”. Shaft has been showing a few new plays in their book with the later acts of this series, intriguing me to see how these experiments will pay off in their other works. It is the kind of creative boundary pushing that can take drama and art to whole new levels and is a great crusade for the arts of anime. In One Line: Rei attends the media session for the finals, Kyouko comes to her step-brother at the end of her line, and the new year’s Shogi rankings are announced. With only eight episodes left in the series, I have started to wonder where things might be going for Rei and his introspective journey with an inherited talent. One week momentum feels prime for a slugfest, and the very next we are in for a long haul. With the main tournament of the series so far wrapped up and the conclusion far more anticlimactic than forecasted, the messages being conveyed are becoming far more complicated. Trying to define the series as an archetype really is off the table when the biggest “goal” for the main character is downplayed and life goes on in the series without a hitch. Perhaps that is where March has hit a bridge into a new area of character development for Rei: accepting his shortcomings and growing as a person. It feels so basic to see a character eat their pride, yet fits into the unique storytelling seamlessly to see it done in a fashion like this. Defeating his sister’s dangerous boyfriend and winning the day never felt very becoming of him, and instead of sulking into eternity, he opens his doors to learn under others- a spark that speaks volumes to how far he has come. It is hard to predict where March will take things (no matter how tame it might be felt as) in the last act of the series, but this has been a visual and reflective treat. In One Line: Rei swallows his pride, admires the support system he has in friends and rivals, and takes the next step in his career. With Rei down right now, there has been a lot of character development for the various Shogi players introduced so far. Most notably, Kyouko’s unstable nature is expanded on with a really visually stunning segment in the first half this week. The visuals amplifying the comparisons being made to characters (and furthermore, how well it is done) is something to be marveled at. Even though it is really hard to sympathize with Kyouko, her jaded attempts for stability keep her from being downright despicable. Despite the alarming history they had, it is obvious there is a lot of love for her family that is expressed in a complicated matter- it is the source of her pain and fire all at once. It is really enjoyable to see even the minor characters have their moments for the time out of the light Rei has had. Compared to the stoic main, the others are very involved in their commentary of the matches going on and offer up quite a bit of information as to what the situation is. While it obviously can’t continue much longer, a break from the normal introspection is really nice. In One Line: Kyouko desperately tries to win the affection of Gotou in the midst of the finals, Rei discovers maintaining a normal school life might actually be more difficult than anticipated. Really fascinating to see someone second guessing themselves and falling apart in the middle of a Shogi game, let alone to see it from the protagonist of the series centered around the tactical pastime. The confusion and emotions flurrying across make for spectacular commentary on an otherwise quiet game, really shaking up the expectation for the rest of the way from here. Rei kicking himself all the way until the bitter end. The most interesting angle to Rei losing his first match is that it was built up so perfectly for a big showdown with the person he hated the most, only to be brutally crushed. Such a young star typically quiet and robotic just sprinting off crying after a loss speaks mountains to the amount of professional and personal pride he has in a game that he originally despised for what it did to him. Sulking around his apartment in defeat to the visuals of various water-rich shots eases the message of depression in a subtle way that is on par with the rest of the excellent direction to date in the series. The age old question of What am I doing? echoes through an empty stairway occupied for lunch as lifestyle choices are weighed in a very organic way. Indeed, there is a genuine realistic feeling to the characters and events of March that mirror the ordinary life coupled with the beautiful aesthetics. In One Line: Rei tumbles from his first massive loss and licks his wounds. Be it by the show’s actual design or just a creative liberty taken, isolating Smith’s character from the louder upperclassman has really paid off, and it is on a brilliant display in this episode. I could be mistaken, but this is the first time in the series that an entire half is devoid of Kiriyama, leaving for a fascinating peek into the mind and heart of a competitor previously unknown to the audience. What is more is that without the rage Rei has for Gotou fogging things, we see just how crooked the man really is through the eyes of a stranger in Smith. The old rule of “if you look ahead you’re going to get socked right under your nose” has full marks in the second half as Rei is rocked mid-match by being outsmarted. While it doesn’t have any clear indication that he has lost, getting checked might go quite the distance in calming down the rampaging prodigy. With only this and potentially the final to go, there is a steadily increasing pace that is incredibly easy to miss otherwise. If you recall, I threw down the gauntlet in my case for this series late November saying that this show would be worth it all come episode fourteen-sixteen. I might be off a tad, but it is hard to argue that it won’t be binge worthy after that point with this late stride it is hitting. In One Line: Smith goes through his pre-match rituals only to be crushed by Gotou as Rei’s boiling anger blinds him from a critical mistake in his own match. There is a lot to love in the first new episode we’ve seen this season, right from the brand new OP to the eerily beautiful ED accompanying the turn of the year. The production value is noticeably higher, and the character models are animated even smoother than ever before. Most shows make that kind of jump between seasons of a multi-season show being aired, but it is still really nice to see something that wasn’t really lacking in artistic flare arriving to the party with even more of it. With the introduction of Gotou, the match to the kerosene spilling mess of a stepsister Rei has in Kyouko, there is such a raw layer that is added to the series. Our stoic protagonist is enraged by cold words unlike any other brutal thrashing another has given him to date (speaking of thrashing, there is a pretty unbearable one taken physically by the same people as well) as his senpai Smith has to hold him back. You can feel the rage quelling over the confusing love he still has for a woman that despite being an absolute heathen to him, he still views as family. Such subtext is all over the place after the dispute and hypes up the inevitable showdown up immensely. The episode sprinted triumphantly towards the end with one tear-jerking interaction between the youngest Kawamoto, Momo, and Rei- Rei breaks the news that he won’t be able to visit his “kotatsu” until he wins his big match and she innocently wishes him luck. Rather than the usual somber walk down the the same bridge taking back to his apartment, there is a spark of competitive fire in the resilient Kiriyama. In One Line: March began the Winter season off on the right foot with upped production value and a terrific antagonist in Gotou. Who knew that having a breakdown in the cold of winter would get you sick? Rei’s bed ridden time in this episode was actually a really touching go, with plentiful amounts of reflection on things of value in family and company. The comedy in this episode really felt genuine and wasn’t forced one bit. There can be a lot learned by how well that aspect of the show works when it is firing off the right cylinders. With far more dull ways to show someone being sick and sleeping days away, there is merit in how well March executes the illness. Such maturity will go as an overlooked element the series did so much better than the field, but it is an underdog for it. There was a lot of Kawamoto drama glanced at (only makes sense since Rei spent a majority of the time in their home) that hasn’t been touched on just yet. I liked the bit on the lack of mention by anyone as to the whereabouts of the father of the family, setting up a potentially heavy swing later on. Akari unloads some of the burden she carries holding the household and just how lonely that life truly is, complemented perfectly by her aunt arguing with the grandfather for why she needs to get out of the house more. To wrap, Rei’s reflection on a dream touches the heart (shown in the normal SHAFT beauty). In One Line: Rei falls violently ill, the girls come to the rescue, and Akari shares the final moments of the year with the recovering introvert. I had to walk away from this one after the credits rolled. Every week I go into this series, I admit there is an expectation that things are going to make tiny hops towards completion with signs of improvement. What felt like a fraction of the viewers departing the weekly commute through March town has all but turned into a desolate island once lively with people who had real estate. Last week gave a ripple in the water to create a little buzz for the slow show, even if it was only just enough to get mentioned in most of the community circles. Opening up this week, things took a whole new nature masked by the calm cadence the audience has been accustomed to- one of aggression. At surface level, it looks like a repeat hit of last week’s affairs- Kyouko crowbars her way into meeting Rei again, to gossip about how awful his opponent’s life is and how awful of a burden losing must be on his family. I found the fiery foster sister even more disturbing with the choice of visuals and dialogue between the siblings- using a callback to a gut turning visual we saw back in episode one (one that all but spells something simply deplorable). Doing his usual top tier play, Rei makes short work of his match, a loud troubled man. Pouting his way to what is assumed to be the bar/liquor store to drink away his loss, the man leaves behind his daughter’s Christmas present. Sprinting to hand off the gift, Rei thinks to Kyouko teasing how the man’s daughter just wanted to spend one last Christmas with her father before his sore losing driven divorce separates her family. Filled with hatred for losing, he dismisses the Christmas present, until Rei’s presence annoys the man into taking the gift with one alarming swoop. Long form, slow anime like this are defined by the few moments that are executed from the building blocks so carefully assembled in tiny bits. Twelve episode series might fire the three or four moments it has in far higher frequency, but one that spans two seasons gets a pass as long as there are ingredients in the bowl for it. Right on the turn of the double digits, March runs away with the most emphatic moment of the season. Staring at his hand in silence and shock, the outburst makes Rei crack. Frantically, he sprints and screams through town as he runs himself to exhaustion in a park. Clenching his fists and bawling his eyes out, he professes the frustration for always getting guilt pinned on him for the shortcomings of his various foes. In his own moment of clarity, he flips blame on his opposition, challenging them to fight and practice through their own problems. Finding his reason for playing Shogi not only as an act but a hunger in him, Rei awakens his competitive drive to the very first feeling explosion by the protagonist. I could go on for another 500 words how beautiful this scene is, but there is a breathtaking aura between the visuals, voice acting and raw emotion of the scene so perfectly directed. It will never be the anime of the season, or maybe even next season, but this show is going to be remembered as special. I’m no gambling man, but I believe in that so much that I would bet my bottom dollar we haven’t seen the last of these moving moments. This is prime Shaft, and a quintessential emotional haymaker that would leave even the biggest skeptics of March hard pressed to not appreciate it. In One Line: Kyouko stirs up Rei’s guilt again, a disgruntled foe lashes out against the Shogi prodigy, and Rei has an emotional outburst. There’s a certain odd way that March likes to deliver drama paced with comedy throughout- it is calculated and makes for terrific theater. A really good example can be found in this week’s episode showcasing the match between Rei and dwindling Shogi player Mr. Matsunaga. At first glance, this entire matchup between someone who just doesn’t win and a prodigy is either a complete joke in its own right or a textbook situation for some humbling upset to occur (something I was anticipating). While there certainly are flavors of the former, I was impressed with the direction the show took the match. From Rei’s perspective, his opponent was being unprofessional and scrambling wildly. It isn’t until in the last legs of the episode the audience learns of why such an elder player was acting this way. After a long winded comedy segment in the middle to break up things, the gloomy situation Kyouko rattled Rei’s cage over is at hand: With a loss, Mr. Matsunaga was going to retire. Facing opposite of one another, the shot couldn’t have been any more perfect for a full exposure of the heart and soul of a competitor. He cries out how all he wanted to do was “look cool losing” but something in him made him struggle until the end. What I find to be one of the most important things to happen yet in the series shows some real beauty- Rei reaches out to the man and talks him out of retiring. It seems like such a small gesture to ask someone if they enjoy what they do, or to keep competing, but it is another thing entirely to see it from someone who only made his first real friends on his own a few episodes ago. In picking the opposition off the ground and dusting off their moral losses, Rei not only grows as a professional and a person, but he defies the chip on his shoulder that Kyouko constantly likes to put weight on. Moments like these make March comes in like a Lion worth watching and experiencing. In One Line: Rei dismantles the elderly Mr. Matsunaga and spends the evening with him in reflection and thought. The odd cat 3D video makes a second appearance as the audience is told that Harunobu had a fit of anemia after getting so worked up in the video the girls saw the other day. I thought this complemented the off the wall fun for a pretty smart blend of a lighthearted moment with very mature subtext. Seeing how involved of friend he is (even going as far as getting new furniture for Rei’s scarce apartment) solidifies who Harunobu is as a not only a competitor but also a genuine being. Admittedly, I was really off-put by his nature early in the show, but it is refreshing to see someone besides the Kawamoto family who has the best interest in mind for ol’ Rei. Playing devil’s advocate in every sense of the term, Kyouko turns up one evening and really throws a curveball into the fray. There’s such an unease about the atmosphere of a scene when she is involved, and how sporadic her mental attacks can be made for one long held breath throughout the episode. The massive stomach turning moment had to be from the flashback to when her boyfriend beat Rei senseless, all recollected while there was nothing but a sound of concern for his step-sister coming from the Shogi prodigy. Kyouko’s rotten plot unfolds the morning of Rei’s next match, with her blitz of a guilt trip over who Rei must face next. I loved the foreshadowing throughout this piece of the episode, as the “Distant Thunder” title and bit about when he was a child seeing lightning in the day. You get a really sneaking suspicion that Rei is about to lose this match coming up, or that the guilt from winning is going to derail the progress he has made with the depression. For one of the first times since starting the show, the audience is hooked for a “what is going on right now” moment rather than a “what is to come” slow build. I knew things would pick up after that week break, and thankfully it isn’t just the animation that took a boost! In One Line: The lessons in Shogi conclude, Rei recounts a fond memory of his father and the heinous Kyouko invites herself over to see her adopted brother. This was the first time I had to really take a minute to go back and digest each part of the episode independently, as there were huge strides this week. Without anyone else’s help, Rei finally reached out and expressed himself to a stranger in a very triumphant fashion. This stranger he had a breakthrough with was by chance Hina’s crush and classmate, Takahashi. The spectacular visuals accompanying his satisfaction of interaction really celebrated the milestone exactly how it should be cheered. Something as trivial as giving an answer to a personal question that he couldn’t answer last week is managed to look artistic and moving thanks to the top notch animation taking point. The second third of the episode (odd, especially given the typical two-chapter-per fashion) started drinking a bit from the crazy potion with a peculiar VHS recorded match between Rei and a competitor, narrated by none other than Harunobu. Seeing as the situation came about from Takahashi coming for dinner with Rei and Hina, the tape can be overlooked by the development there. It is also established here that despite knowing he is a professional, Rei’s celebrity status was not known in the Kawamoto household. Whatever the case, this sparks an interest from Hina to learn Shogi- something very interesting to me in how much Rei was moved by her request to be taught. After all, he said rather hollow words about the craft and expressed no desire for expression. The one-on-one conversation really must have turned the emotional gears (something I am hopeful will spice up the plot now). Also, the last third to the episode was a pure comedy move and nothing else. It probably is a hit with most audiences, but it was lost on me. The strange educational song and 3D graphic cats showing the rules of Shogi felt like some bizarre subliminal brainwashing scene in a classic psychological thriller. The scene wasn’t awful by any means (I’m not that much of a grump! ), but it can be forgiven after the feeling was thrown on the “high” setting the last hour of showtime before this week. In One Line: Rei has a pair of emotional breakthroughs due to making a new friend, Hina and Momo are taught how to play Shogi by Harunobu. While it might not look like it on surface level, there was quite a bit going on here in the entirety of the episode. Introducing itself at first glance as a potential vacation episode (the first two scenes involved brainstorming travel locations and a school trip), there began a very calculated juggling act of a couple of storylines developing. The first was in the current time, with Mr. Hayashida (the teacher from the roof scene in the beginning of the show) lending guidance over lunch. A growing trend can be found with just how much more we are starting to see with interactions for Rei outside of the girls, which is a very interesting thing to keep note of. The second, and potentially most difficult to breakdown part is just how much focus went into the comparison of the current Shogi champion to Kiriyama. After the dust settles it is easy to see that it was to subtly indicate that Rei has a lot to carry in expectation and comparisons to other prodigies, but such subtleties draw the line for those who have been critical of the methodical pace of the series. The last bits, however, are by far the calling card as to why this show is so worth sticking through with. Amidst reflecting on his early slumps, Rei compares his depression to swimming through endless stormy waters, going from island to island. Stuck on one of the islands, he loses the “battery” to do things as essential as eat. Between the favored shot of water circling the drain, sinking, and the heavy use of dark shades as the damning words of his step sister dig under the skin, not much else is needed to deliver the point (as we have seen). The analogy, however, manages to take what should be overkill and translate it into an impactful dive into the human condition. Couple it with character development in Hina finally piecing together what her sister meant in Rei going through a rough time, and you have a well executed conclusion to another steady week. It may be lost on a growing impatient audience, but it is impossible to resist the special vibe coming from March. In One Line: Speaking over lunch with his teacher, Rei ponders his intentions for studying in high school and the expectations of being a prodigy. To no surprise, this week turned the dial up far more riding off the coattails of last week with a hard hitting one-two punch of flashbacks in each half of the episode. Considering that there had only been tiny flashes of Rei’s situation that could be pieced together, it was incredibly forward of the show for diving into his past with such detail. It doesn’t take much to note that this was the fastest pitch so far, but it is also worth noting that it was handled with the same methodical artistry steering things so far. In several of their shows before, SHAFT has always made it their calling card to really bring the most out visually to match the level of drama in a scene. It is a lofty feat to accomplish, but with the jaw-dropping detail and direction between the chapters here, there is no doubt that they’ve nailed another one with March. The best part about things to come has to be without a doubt that there is an immeasurable amount of potential for a repeat of impressive scenes beckoning their scene reading transcriptions into the stunning visuals. Psychological warfare is on the menu for our young shogi player, and I couldn’t think of a better team to convey the impact Kyouko is going to have on Rei (after all, we were introduced to the entire series with an unsettling nightmare of the very same). In One Line: Rei thinks back to coming under the wing of Masachika Kouda after his family catastrophe, the toxic situation he created within the Kouda household, specifically the level hatred the daughter Kyouko has for him. March continues to find its rhythm in a really fun spirited episode, featuring a little bit of everything short of the actual game of shogi that has made it work up to this point. The comedy feels organic, the emotions are raw and fleeting, and there is just enough sprinkled in the mix to remind you of where everybody is standing in their own personal situations. Rei sort of takes the backseat in both halves to this episode, as Hinata fights with Akari over constructing a lunch for a longshot crush and Harunobu befriends the girls whilst out in town with Rei. While it can be risky in high doses to do, it is a nice change of pace to have outsider commentary on the growing experiences of others portrayed here by our protagonist. It might be argued as still too early to throw it under a microscope, but it really is admirable just how much care goes into plugging the most subtle of hints into the growing plotlines that will probably be bulldozing their way through our feelings in the later acts of the series. You hear Harunobu fidget over his food choices (as his health was brought on the radar last week), but it isn’t blasted across the narrative in some flashback scene to literally an episode ago. While comforting a rejected Hinata, Rei has a brief contemplation over what love is and a rather dark scene is played out briefly between him and a woman. Perhaps this woman is related to his nightmares he has, or it is just another brick from life crashing at the glasshouse of depression. Regardless, this show doesn’t hold your hand and exposition the living daylights out of the audience in a belittling fashion- it wants you to think and it trusts that you will understand what is going on without it having to scream “Look what I did!” for its messages and development to occur. Unless there is an uncharacteristic display of events in the immediate forecast, I don’t see this changing for a large (if not entire) duration of the show. In One Line: Hinata goes all out to impress her crush, Harunobu is a massive hit with the girls as Rei gets some downtime from his shogi playing. Easily the most consistent of the bunch so far, this week offered an incredibly entertaining first half in Rei’s match with his rival and in the second a discovery that all that glitters is most certainly not gold. The tonal issues from the previous episode weren’t present, as the comedy bits were small enough to only help the the story without becoming a serious distraction like before. I’m not ready to write off that fear as something that might hinder an impressive overall product, but the control evident here is a pretty good sign for the immediate future. The show has one of its darkest moments mere moments after a lighthearted one and simmers it down to a light boil whilst appreciating one of the many beautiful background shots. Previously, I had expressed that the SHAFT style of animation flare was as great to see as always, even if it was a little bit much to see at the time. During a flashback match Rei has and bits of his current one, there are shots that really provide subtle visual aid (something that is a cornerstone to most discussions in the Monogatari series) and flex the creativity of the direction. While relying on it too much might risk getting stale, I believe keeping it to something like that would benefit the series immensely. I had my thoughts before that there was something special in this series, and by the time the ED rolled around this week, I was a little bit more confident that it would prevail. There is a lot more elbow room for things to happen yet, and if they can turn in a dozen more episodes as good as this one, it’ll reach heights well above the rest. In One Line: Rei plays Harunobu with a recollection of their long-time rivalry and is greeted with a much different vibe from the Kawamotos. This week’s showing is something of a baffling one- completely throwing me off the trail for identifying the direction the show seems to be taking. I mentioned before I was wary of the introduction of the high energy rival character in Harunobu Nikaidou at the conclusion of the first episode. In tandem with the downright craziness that is another one of Rei’s competition, Issa Matsumoto, the first half of this episode is completely hamstrung in a tonal shift that leaves a pretty sour taste. Despite a pretty interesting play by play of his match, the off the walls behaviors and style the series takes when a character like these two are present doesn’t particularly settle well. It is one thing to know it is a part of the series if the wild behaviors make the characters in question more endearing, but for something primarily being pitched as a serious drama, the “comedy” went a bit too much up the dial there (albeit SHAFT did their thing with making the art choices match the hectic situations). While some might wager it is reaching, there is a lot of symbolism in Rei’s early struggles alone in the city before he met the Kawamoto family and him getting safely helped by Akari when he was too weak to return home on his own. That scene and the brief shot of Rei frowning at hearing after winning another match that his opponent was banking on winning to have his sick grandfather was him on television were probably the more redeeming parts before the episode cut into the next chapter. In contrast, the second half of the episode was simply a thing of beauty. The imagery starts to come back and mesh well with the storytelling as the tone lowers back down to a sane level. What interested me with the direction in March most certainly is just how well executed something as basic as walking to a grocery store can be. Rei refers to his stroll through town as “soothing” perfectly- the music is relaxing, people move organically, and the little details mixed in with the choice of shading strike all marks. My favorite shots in the series so far have come from the bridges, so there was a lot to be found in this half episode. Coupled with the introspective take on how he handled his parents passing in an accident, this is exactly the right place I want to see the series build off of. In One Line: Rei wins another match, taken out to a restaurant with his senpai and then celebrates Obon with the girls. Immediately, we are given dark and twisted imagery that sets off red flags left and right for the protagonist, Rei. Putting aside what we already see in the stellar opening, a nightmare looms with shots of water circling a drain, flowing through darkness, and our main character sulking under a bridge to the voice of a woman saying horrible, unsettling things like “See? There’s no place for you here in this world.” It all sets up a quick gut-wrenching feeling that Rei is struggling fiercely with depression of some form. One of the more impressive things about this has to be how there isn’t a character who screams exposition at the audience about the character (or in the case of a lot of shows, the main character narrates for so long that they are depressed that it almost overkills the point), and the story simply continues without questioning the intelligence of the viewer. Call it pretty early to give points for, but if it keeps it up like that, it’ll go a long way of separating itself from other series with depression as a primary character defect. Quietly, he wakes up and takes a train to a Shogi hall whilst some really jaw-dropping citylife aesthetics are showcased. The animation is done with a very signature shading style that Shaft has been praised immensely for with their previous work. Perhaps even better is that while it is unmistakably the work of their artists, it still has a uniqueness to it that sets it apart. An unnamed man plays a competitive round of Shogi with Rei, posing questions and small talk to no avail. Without so much as word in return to the man, Rei talks under his breath after the departure of what is revealed to be in passing his foster father. I found that the lack of dialogue might really come off as polarizing to someone expecting a “read-along drama” of sorts, however the move is much more artistic (no matter how uncommon it might come off as). Rei reluctantly gets invited to have dinner with a girl he knows, Hinata Kawamoto, and her sisters Akari and Momo. Cheery as the mood is for him, Rei is crushed and soon falls asleep from exhaustion accompanying the reality of defeating his foster father in their match, ending the elder’s chances for league entrance. Hinata later enters a dark room to tuck in the passed out professional Shogi player to find he is unconsciously sobbing from his nightmares. Rather than rehash what might be a recurring nightmare for the protagonist, I loved the outside perspective of seeing his struggles with the subconscious in physical form. Like the dialogue, it’s not screaming for attention, but leaves enough for effect. Chapter two offers less as we learn of young Rei’s profession while he eats a Kawamoto prepared lunch with a broke teacher on the roof. The teacher rambles on about how Rei must make a lot of money before storming off realizing his student rakes in a bigger salary than him, all to minimum to no words spoken by the other party involved. In a much weaker second half to the episode, this rooftop scene really carries the load with the teacher acting out serving a pretty interesting spin to the school life for Rei. My gut tells me that if a faculty member to the school has a sort of sour reaction to the income of his student, then there is absolutely no possible way the stoic Kiriyama can find much to go off of with his peers (not to mention there’s a chance they might loathe him for it). The more we are seeing into the life of the young man, the more the nightmares become understandable. I love the “show, don’t tell” approach to things here and sincerely hope it can continue to count its paces as such. Later after school, Rei assists the Kawamotos at their shop as a way to give thanks and departs to practice for a match the next day. In a rather sudden cliffhanger, his entry ticket to the event has been swapped by a snickering portly boy boasting about his crime as the credits roll. Even from an outsider taking in the events in chronological order, it isn’t challenging to agree that a cliffhanger of commercial proportions is a rather sour note to end things on in an otherwise flawlessly executed pilot. The episode could have easily concluded as was and the portly boy get introduced in the following episode (perhaps on the way to the Shogi hall or even there). I get that it’s business but for something with so much attention to detail, it’s hard not to be a little disappointed with this abrupt conclusion. All in all, I found the introductory episode to this series to show all the right flashes of a modern classic brewing so long as it doesn’t deviate from the well disciplined pacing and tone it is capable of pulling off. 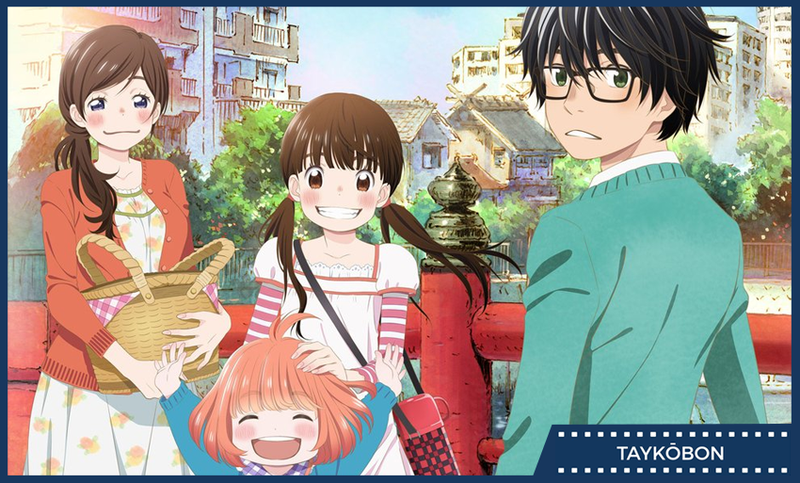 In One Line: Professional Shogi player Rei Kiriyama defeats his foster father, struggles with the guilt for it, and spends the evening with the generous Kawamoto family. We’re Taykobon, your home for reviews of manga and light novels. Be sure to follow us on Twitter @taykobon for more updates and to get the latest happenings! We cover the latest and greatest in Japanese entertainment going international, for a listing of all of our content you can check here. For more info about Taykobon, please check here. If you’ve read this work or have any questions or comments, we would love the hear from you in the comments below!